Anything we don’t have in store is still available! The brodos.net Kiosk combines the advantages of your bricks-and-mortar retail store with the advantages of the internet by giving you largest possible product portfolio. 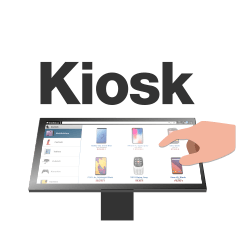 Our kiosks offer not only local products, but extend your range by more 250,000 products through the use of our large product database. The brodos.net Kiosk is not only available to be physically placed in your store: It also comes with a customized online solution – the brodos.net Online shop! Your customers can conveniently browse and explore the entire range of more than 250,000 products at home, and order right then and there. In every kiosk and online shop, the Storeship price list is automatically displayed with a rated, marketable Internet price. Alternatively, you can choose from three further individual price lists with different margins.